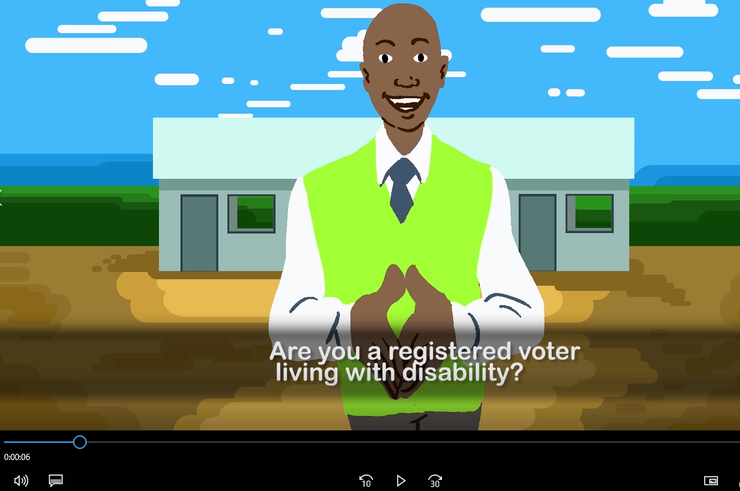 In 2017, the Independent Electoral and Boundaries Commission (IEBC) of Kenya, with the support of the International Foundation for Electoral Systems (IFES) and the United States Agency for International Development (USAID) produced voter education videos, providing information on voting day for voters with disabilities. The video is available in English and a transcript of the video is below. Are you a registered voter living with a disability? Here is what you need to know about voting day! Present yourself at the polling station, you do not need to queue. Go to the queue clerk and they will usher you to the front of the line. If you are an expectant mother, sick or elderly, you do not need to queue. If you need assistance to vote, you can bring someone of your choice to help you, or you can ask the presiding officer to help you. You will have the right to freely choose the person who will assist you to vote. No one may force you to use someone else. The person assisting will be asked to fill Form 32. The person you choose to assist you should be of 18 years, but does not have to be a voter. The person assisting you cannot be a candidate or agent. No person, other than your assister, may be in the voting compartment with you while you are marking your ballot, or while your assister or supporter is marking your ballot. If you would like the Presiding Officer to assist you, they can do this. However, it needs to be in the presence of all agents. You are encouraged to bring someone of your choice to protect the secrecy of your ballot. August 8th #wewendiokusema IEBC, Your Vote, Your Future.